Easily hold this brush while using Milk Paint! The natural bristle holds the paint nicely, slightly absorbing the milk paint and allowing for more control. Measuring 21 cms in length, including the contoured 12.5 cm beaver tail handle. The flat head measures approx. 4 cms x 1 cm, with 5.5 cms of dense, firmly epoxied white china (hog) bristles. For cleaning try our Miss Mustard Seed's Brush Soap. This fabulous brush soap not only cleans but conditions as well! Great for cleaning natural bristle brushes like our Miss Mustard Seed's Paint and Wax brushes or any brushes for that matter. All natural ingredients means it is gentle on your skin as well as being super effective. 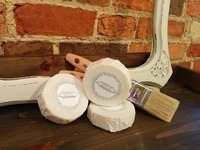 Long lasting and easy to use, this soap is great for cleaning up even caked on Milk Paint from brushes. Miss Mustard Seed has done a wonderful tutorial on using this soap and the best way to care for your natural bristle brushes here.